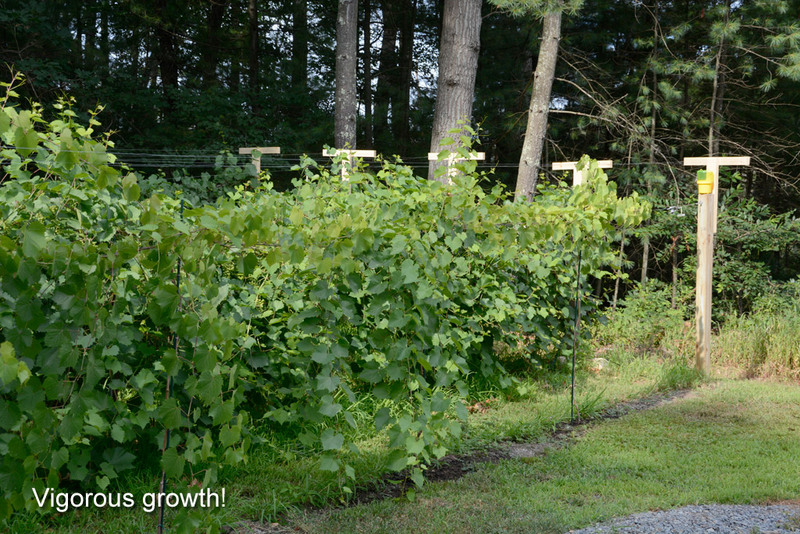 This week I was pretty busy in the vineyard. After a lot of thinking about last year's disaster with birds and bugs, I came up with a netting plan that is considerably more sophisticated than last year's attempt. 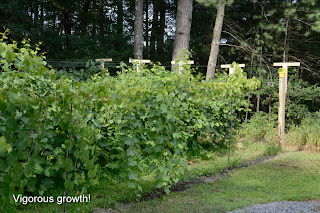 Last year I put bird netting directly over the vines, so it was just laying flat against the shoots. Unfortunately, with the type of trellis system I have, that puts the nets fairly close to the fruit and the birds quickly figured out they could peck through the netting and reach many of the grapes. Some would land on the netting and weigh it down, then peck right through to the fruit. They eat nearly half the crop! The juicy grapes dripping attracts yellow jackets. Once the yellow jackets found the vineyard, a swarm came in and drilled holes into the remaining grapes, sucking out the juice. My entire crop was lost. 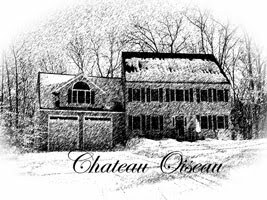 Very sad to have nothing to show for a whole summer of work in the vineyard. I have taken a more systematic approach this year. 1. I am actively reducing the yellow jacket population with baits/traps. This started in March. 2. I am using insect netting this year to attempt to exclude these pests as well as make the bird's lives harder. 3. 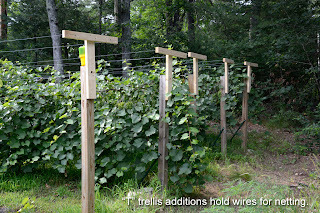 I built an extension on the trellis consisting of "T" shaped pieces that suspend two wires above the vines. I will drape the netting over this apparatus to keep the nets way up above the fruit zone. No pecking through the netting. 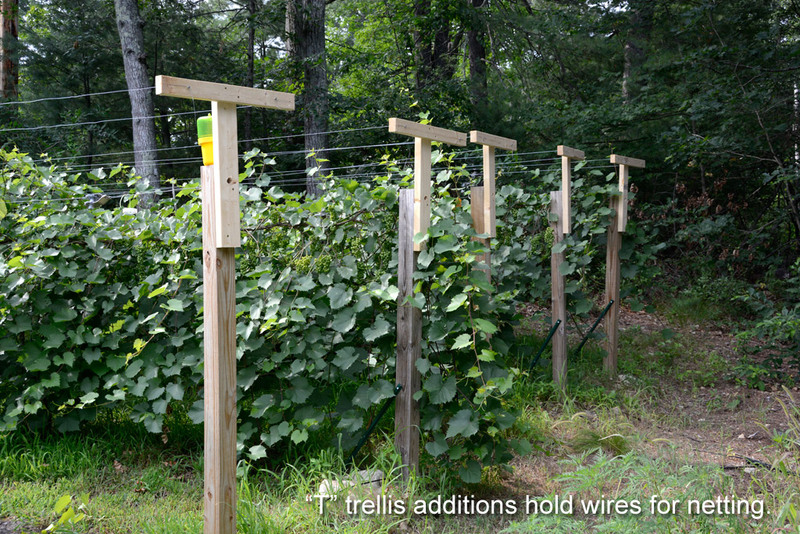 In addition, this can be used like a quasi VSP trellis, to allow some of the shoots that want to up upward to do just that. As you can see from this shot of the fruit on some of the more mature vines (these are in their 4th leaf) I have a good crop to protect this year! 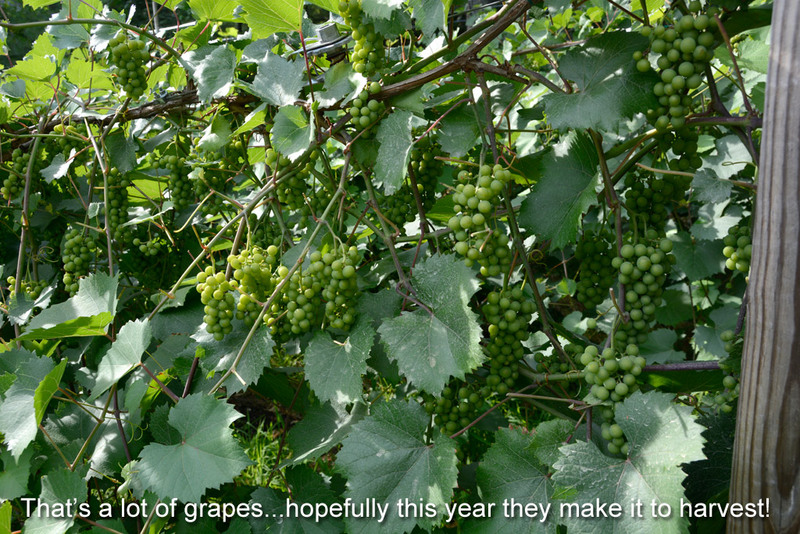 Crossing fingers I might actually make some wine from my own grapes this year. 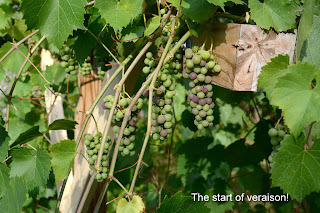 There is a small section of the 5th year vines that are already starting veraison (changing color) so I am now in good shape to get the netting on this week when I can drum up another set of hands to help. So that's about it for now. I'll make another post when the netting goes on and we can see how this all works.